Getting your hair sleek and smooth with lots of shine doesn't have to take an hour of arm stretching, back-breaking work. Follow these steps, and you'll have gorgeously sleek hair easily! It starts in the shower! Use products formulated with keratin to shampoo and condition. 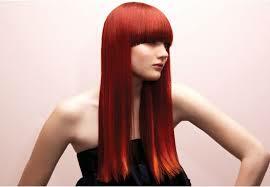 Shampoo, then use a straight-boosting pre-conditioner to maximize the straight effect (this is key!) Goldwell's Kerasilk Rick Shampoo and Kerasilk Rich Conditioning Spray (a leave-in conditioner) are great ones. Use a microfiber towel, not a terrycloth one, which will cause frizz. Pat your hair, don't use the towel roughly. Mimi"s Diva Dryer is an extra lightweight microfiber hair towel that is very gentle on your hair. Seal in the Straight! Use a smoothing and heat-protecting balm like L'Oreal Professional Texture Expert Smooth Velours Smoothing Lotion. Place a dime size amount in hands, emulsify and apply to your damp hair. Blow dry your hair using a round bristle brush, pulling your hair as straight as possible. Alternate between cool and hot settings to not overheat hair. Now use your flat iron to straighten. Warning: Never straighten damp hair. That sizzling sound is never a good sign!